Earlier this week, I wrote a piece about dropping by the New Scubbers. The business is officially named “Scubbers 2 Go,” but I like the name New Scubbers. Due to some publicity from Steve Barnes and All Over Albany, the buzz of the opening at the new location (186 Wolf Road) started resonating. On facebook, the number of people who like Scubbers has doubled and is now close to 400. I also got some feedback on twitter from people I know, and John Jordan created a Foursquare location for New Scubbers. In just reading comments on the various outlets, it was obvious to me that I wasn’t the only person who has missed Scubbers for the last 2 years. On my initial visit, Bernice and Bob, proprietors of Scubbers, indicated there was a chance that they would be having a soft opening on this past Friday. I stopped by that day on my way home from work and was greeted by Bernice at the door. She indicated that they were waiting for approval from the town before they could officially open. Later that evening, upon logging onto facebook, I was greeted a facebook status update from Scubbers indicating that the town approval was final and that the soft opening would be Saturday 10/9 with a limited menu. Luckily, I had availability to go. The storefront is very simple and spacious. 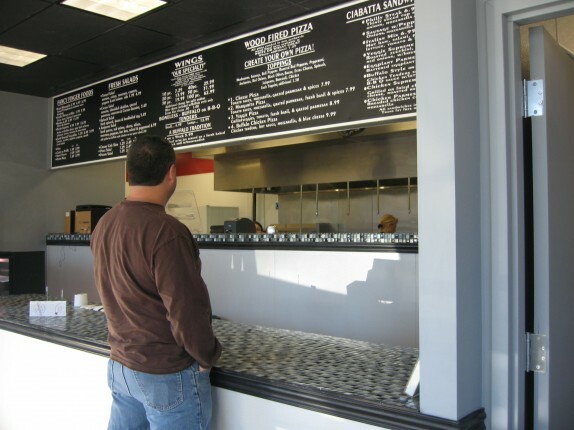 On the left as you enter, there’s the area where you order and where your food is prepared. 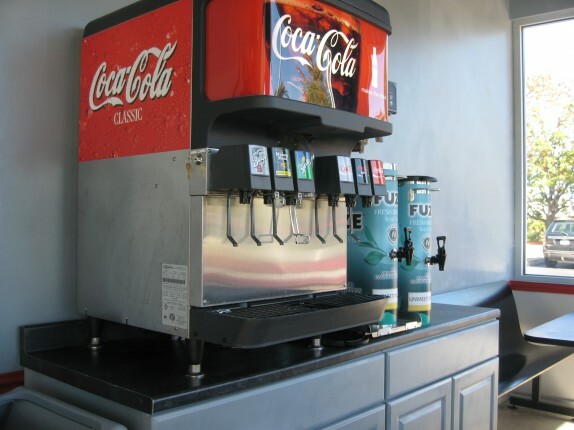 To the right is an area with a soda machine, some brewed iced teas and a very small amount of tables and chairs. I am very much a creature of habit when it comes to restaurants I like. I will always order the same thing. 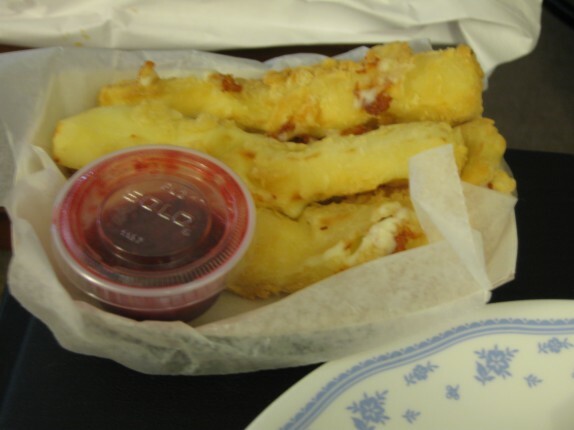 Ever since college, with the exception of a brief stint on the Atkins diet, I always ordered Buffalo tenders and mozzarella sticks with raspberry sauce. That’s what I did today, but I ordered my tenders hotter than usual (x-hot) since my taste buds can handle more heat lately. I opted for my order to go because I had a few things to do at home. To say it was just what I remembered is an understatement. I was so happy to have this mix of flavors once again. Both the tenders and the mozzarella sticks have just the right amount of breading and have a good crunch. 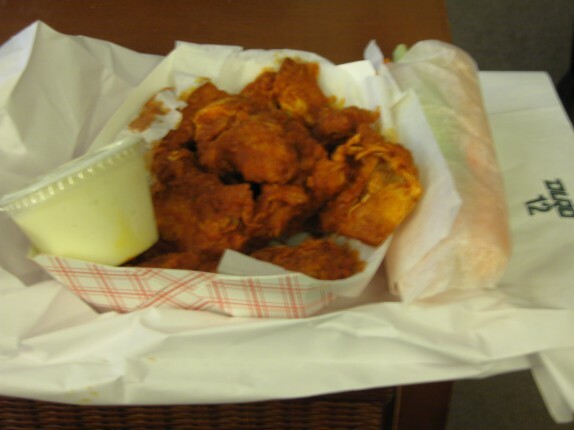 The secret to Scubber’s Buffalo products (either wings or tenders) is the sauce. There is something about the sauce that no other establishment in the area is able to accomplish. Scubber’s sauce is able to provide a good coating to the medium as well as deliver flavor and heat that is unrivaled, at least in the area. And I’ve tried them all, your Buffalo Wings and Rings, Wings over Albany, Buffalo Wild Wings, and so on…nobody is able to execute Buffalo-style in this area quite like Scubbers. While I was in the restaurant, a reader recognized me as the dude who wrote the post that Steve Barnes linked. That was pretty cool. Plus, since it was technically my third visit to the new location, I checked in and became the mayor on Foursquare. So between the return of my favorite Capital Region restaurant, being recognized for blogging, and becoming mayor of my favorite place on Foursquare, I’d say 10/9/10 was a pretty good day for derryX. remove “at least in the area” and I agree with you 100%. Can’t wait to get to Albany to give these a try again. Congrats (AND THANK YOU) to the owners for reopening. Thanks, B. Real. I seriously love Temples of Boom!